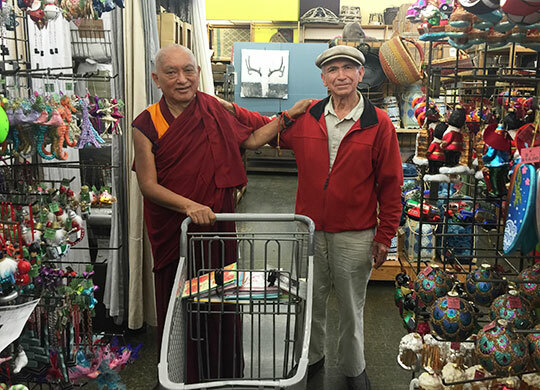 Lama Zopa Rinpoche with a new friend he met while shopping and to whom he gave a 30-minute introduction to Buddhism, California, US, October 2015. Give a Gift that Helps Others! Maitreya Projects Soon to Host Relics! Congratulations to an FPMT Center on Its 25th Anniversary! Gyaltsab Je Study Group Now a Center! 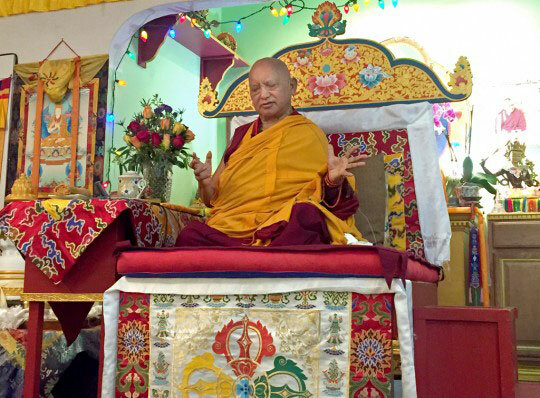 Lama Zopa Rinpoche teaching at Tse Chen Ling, San Francisco, US, October 2015. 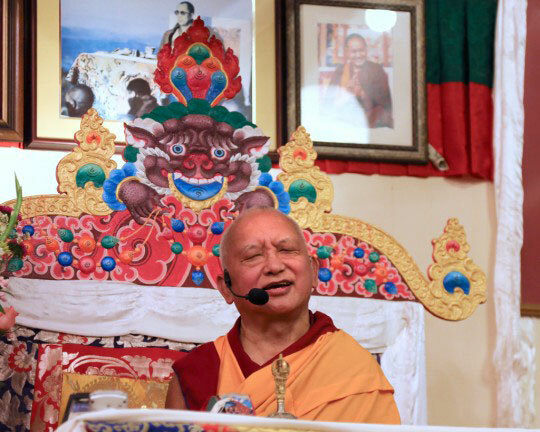 Lama Zopa Rinpoche at Land of Medicine Buddha, California, US, October 2015. In early October, Lama Zopa Rinpoche visited Land of Medicine Buddha where he gave this dynamic, seven-minute talk on the significance of Dharma centers. Lama Zopa Rinpoche in the meadow at Land of Medicine Buddha, Soquel, California, October 2015. “The most unbelievably important thing in our life is lam-rim. The practice of the three principal aspects of the path is the most important thing. This is the most important, more important than a job, money, or anything else in our life. 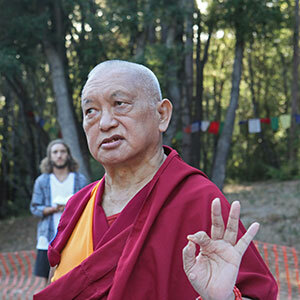 It is the most important thing,” Lama Zopa Rinpoche teaches in the module “Advice for Realizing Lam-rim,” which is part of Living in the Path, FPMT Education Services’ essential lam-rim program as taught by Rinpoche. His Holiness the 14th Dalai Lama Tenzin Gyatso, Rimini, Italy, July 2005. Photo by Piero Sirianni. 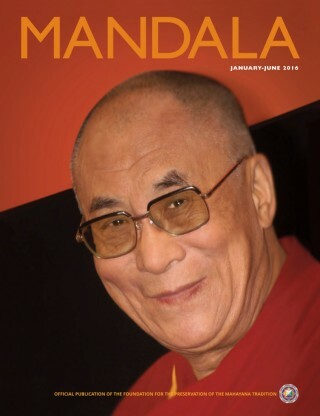 Lama Zopa Rinpoche personally chose this photo for this issue’s cover of Mandala. The new issue of Mandala features interviews with the 102nd Ganden Tripa Rizong Rinpoche; with Jangtse Chöje Lobsang Tenzin Rinpoche, who will step into the position of the Ganden Tripa in the future; and with Samdhong Rinpoche, the former prime minister of the Central Tibetan Administration. These three important lamas share their understanding of His Holiness’ vision to preserve the Gelug tradition, the significance of Lama Tsongkhapa’s teachings and the importance of the monasteries in preserving them. Mandala is a benefit of the Friends of FPMT program. FPMT Charitable Projects has a new alternative to material gift giving. This holiday season, you can give your loved one a gift that offers food to monks, liberates animals, builds holy objects, or provides social services. If you don’t really want to give another material gift, give them something that will bring long-lasting benefits to others! Lama Zopa Rinpoche at Land of Medicine Buddha, US, October 2015. Rinpoche recently reminded us that FPMT centers should offer extensive Lama Chöpa with Tsog on Losar (Tibetan New Year), to honor the anniversary of Lama Yeshe’s passing away. Rinpoche added that it is good to do this at the time Lama Yeshe passed away, which was at 5 a.m. (on Losar in 1984). 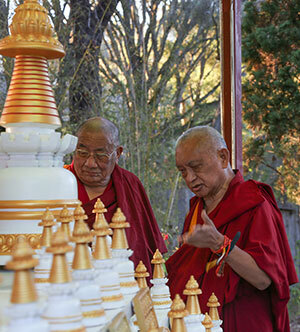 Rinpoche emphasized the importance and benefits in offering tsog on that occasion each year. So please plan this at your center this coming Losar, which is February 8, 2016. In addition to this, Rinpoche also said for centers to start the tradition of telling stories about Lama Yeshe every Losar to keep his memory alive, for example, by inviting older students who knew Lama to share their favorite stories, or by watching video or reading published stories of Lama. Watch the video of a talk given by Rinpoche in July 2012 on the benefits and importance of Dharma centers and study groups. This beautiful large thangka of the 35 Buddhas was painted for the Foundation Store according to the instructions given in the The Preliminary Practice of Prostrations by Lama Zopa Rinpoche. Receive a special discount when you invite this holy object into your FPMT center, project or service. Lama Zopa Rinpoche with Geshe Ngawang Dakpa, California, US, October 2015. We are delighted to announce that the Maitreya Projects in India are moving forward. Lama Zopa Rinpoche has advised that all the relics currently touring via the Maitreya Loving Kindness Tour should be placed on permanent display at the Maitreya Projects in Bodhgaya and Kushinagar, India, as Rinpoche feels it is very important that the relics are at the sites for pilgrims to pay respect to while the statues are being built. This means that the Maitreya Loving Kindness Tour will finish at the end of 2015. Kurukulla Center, USA, is celebrating its 25th anniversary of offering the Dharma.